Both of my boys are huge Teenage Mutant Ninja Turtles fans, not so much the cartoon series, but the love the toys. The got the Teenage Mutant Ninja Turtles Shell Raisers Remote Control vehicle a few months back and loved it. Santa also brought them the Teenage Mutant Ninja Turtles Secret Lair which they absolutely love and haven’t stopped playing with. When they received the Teenage Mutant Ninja Turtles Pop-up Pizza Playset and the Turtles Action Figure Mutagen Ooze Don they couldn’t wait to try them out. 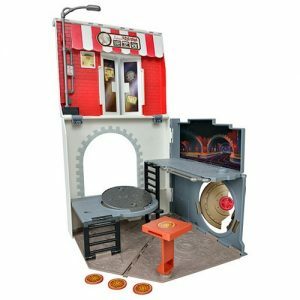 The Pop-up Pizza playset is great, everything can be stored inside the pizza set, with the exception of figures, you can travel with it and open it out for play time fun. The pizza box itself is 45cm tall when transformed, surprising when you see the compacted size of the pizza box. It doesn’t come with any figures but they can easily be bought and added to. I was really surprised when I opened this up and saw everything inside. There is a pizza Frisbee type launcher, a sewer hatch for the turtles to escape from, a trap door and other doors that the goodies or baddies can come through. The boys loved firing the pizzas and playing with the turtle characters they had at pretend fight scenes against Shredder, etc. Then folding it down into it’s pizza box and taking it over to their Gran’s house. From a parents point of view it takes up hardly any storage space and is pretty sturdy for being able to fold. The boys had great fun, so it gets a thumbs up from us. The boys also tried out the Mutagen Ooze Don Figure. 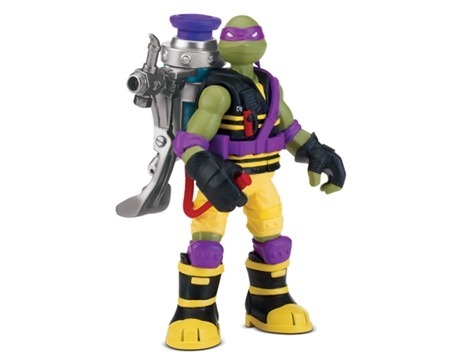 The figure itself is great and has all the weapons that Donatello is know for, but I wasn’t keen on the ooze. You don’t need to use the figure itself with the ooze he works just as well as a Turtle character and can be moved and poised into all sorts of positions and holds his weapons. The boys loved playing with him in the pop-up Pizza playset. They played with the ooze outside as it does say on the box it might stain. It was pretty icky and they didn’t like it much. The character, Donatello gets a big thumbs up from the boys and I, but the ooze a big thumbs down. Teenage Mutant Ninja Turtles are one of the boys favourite toys to play with and will be for a long time to come.